In the weeks and months before, 250 artists will strategically move entire inventories of art objects — everything from Steampunk hats to miniature sculptures — into the vast space near the Magnolia Bridge for the festival. A creative web of logistical activities must take place. Garages, office spaces and spare bedrooms overflow with materials. Application deadlines must be met. Scaffolding, display materials, lighting and the other necessary infrastructure that large events demand must be acquired. You don’t need to go to art school, but the average individual artist needs the mainline skills of a CEO to successfully manage these events and sell their work. Heather Daveno works as an office manager by day and full-time artist by night. She designs and makes hats drawn from global cultural influences. A self-taught artist who lives in the Northgate area, Daveno testifies that her best teacher is trial and error. “I have also torn thrift-store hats apart to find out how they are made,” she said. The artist also donates 5 percent of her sales to the homeless organization Real Change and has also participated in the Bellevue Arts Show and the Seattle Gift Show. 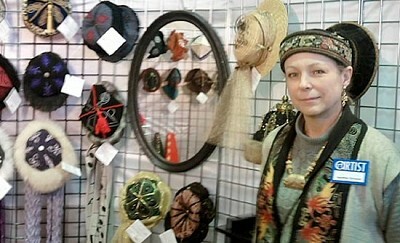 Daveno designs her hats one at a time from reclaimed textiles and found objects. Working with unique materials allows her to produce distinctive, one-of-a-kind pieces of functional, historically inspired art. The hat maker has attracted many avid collectors of her work over her 10-year-plus career. Some artists, like Marcell Marias, start out with the dream of eventually running their own art business. This summer, he decided to enter art fairs and shows. The Best of the Northwest show will be his first large-scale event. His work, sold in retail stores and community markets, is all made in his University District studio. He explained of his work, “The connection to them involves the materials that I use, which are all repurposed and mostly vintage kitchen items, surplus materials and other found objects. I want to make sculptures that have the least impact on the Earth by utilizing the least amount of new materials, and by using bolts, rivets and screws, not welding or glues. Marias also does freelance Web design, audio/video production and music production. He loves watching his buyers’ reactions and notes that they seem to seek out the robot that most suits their personality. “They resonate with the particular personality of the robot or love the materials that they are made of — for example, hole punches and funky kitchen items. They buy them as gifts for others and themselves. Most of them say that everyone who has seen their robot loves it. It’s very humbling and encouraging." For more information about Best of the Northwest, visit www.nwartalliance.com. To comment on this story, write to QAMagNews@nwlink.com.